This is an Indonesian-inspired chile sauce that can be used to "heat up" any food, such as stir-fry, pizza, pasta, or anything you prefer. We recommend it in this recipe for Vietnamese style beef soup. Some hot dog vendors have it as a condiment as well. Ingredients: chili, salt, distilled vinegar, potassium dorbate and sodium bisulfite as preservatives. 8 oz. Product of USA, made in California by Huy Fong. 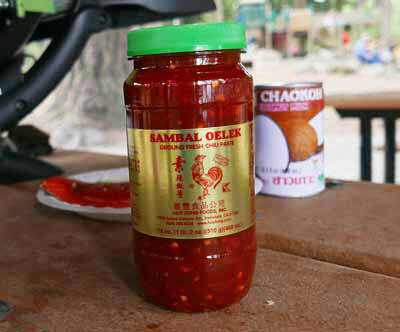 We also offer Chili Garlic Sauce in the same brand, as well as Sriracha sauce. If you are looking for the "real thing", we are pleased to recommend Sambal Oelek in the premium Kokita brand, imported from Indonesia.